What is an Immersion Tube Burner? 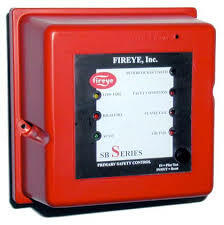 The Fireye sbSeries Flame Safeguard Control a microprocessor based, modular burner management system is designed for automatic ignition with continuous flame monitoring in commercial heating and process equipment firing any fuel. The sbSeries are tested to EN298 and CE-certified in compliance with the directives for gas fired appliances and electromagnetic compatibility. The control unit includes all the necessary digital logic & analog circuitry to control the sequence and monitor the flame of single gas, oil or combination gas/oil burners. Three control sequences offered are no-purge, purge, and modulation (air damper control). The part number indicaters the various features such as the flame sensor type, control sequences selection, proof of air opening at start, and timings; therefore the designer has control & protection against field tampering or modification of critical sequences. LED indicators are offered on the face the controller, indicating current status of the burner including lockout alarm. A recessed test jack is built into the front cover which provides real time reading of the connected flame sensor. This same jack is also used to connect to an alpha-numeric display. A push button provides reset from lockout as well as initiating a check condition usable for pilot turn down test. Controllers in the sbSeries flame safeguard family are plug-in design and available in models that operating at 120 VAC, 50/60 Hz or 230 VAC, 50/60 Hz making them universally applicable. Sensors that are compatible with the Fireye sbSeries include flame rod (rectified ionization), ultra-violet (UV) scanners, and self-checking UV scanners for continuous operation. If you have any questions about the Fireye products, or you are ready to purchase this or any other commercial industrial heating product, please give us a call.